God gave us the power to heal ourselves. Ever wondered where the nasty bruises and cuts we've incurred during our childhood go? Ever wondered why that overly painful wound we got on our right knee stopped bleeding? Ever wondered why we have fever yet we are still able to do certain tasks? God has instilled us with it. Yes, we have a powerful army within us that fights off bacteria and viruses. We have the best pharmacy inside us, bringing just the right amount of healing for our physical ailments at the right time. But because we have not yet grasped the idea that we have a built-in healing mechanism, we have somehow adopted the alcogel culture. Notice that hand sanitizers and wet wipes have been a necessity these days; it seems like we are so afraid of getting germs into our bodies. Prevention is always okay, I agree. But, as Bro. Arun puts it, too much of it actually weakens our healing mechanism, making it lax in fighting off bacteria. The key is still to strengthen our bodies against diseases. Okay, I've done that, you say. I have been taking care of myself. I have been strengthening the healer in me. But why am I still sick? But what exactly are these toxins? When we are gripped with hate or anger that our blood pressure rises up to the heavens, that's toxin. When we are depressed and continue to wallow in sorrow that we feel that our body weakens, that's toxin. When we worry too much and fear everything that we eventually experience headaches, that's toxin. Remember that our body and our soul are one. Our soul, when wounded by such toxins, manifests its pain outward in our body. So when we remove the toxins in our soul, we remove the sickness in our body. But apart from believing that we have a healer within us and removing the toxins inside us, let us also change our mindset and our expectations. With a strong healing mechanism should come the right expectations. Expect to live a longer life. Expect to live a stronger and brighter future. Expect to have more years to make our dreams come true, enjoy happy relationships, and create lasting memories. So there. Three points to remember: 1) We have a built-in healing mechanism. 2) We should remove all toxins in our soul. 3) We must have the right expectations. 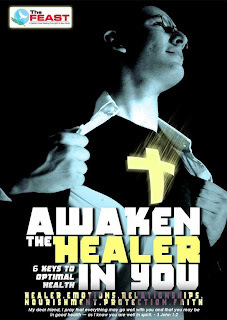 *This is Talk 1 (Healer) of the Awaken the Healer in You Series held at the South Feast. The South Feast, a weekly gathering of the Light of Jesus Community (LOJ), happens every Sunday at Festival Mall Cinema 10, Alabang, Muntinlupa City, at 11am and at 3pm. It is led by Feast Builder/Main Preacher Arun Gogna. LOJ is a Catholic charismatic community led by Bo Sanchez.